The history of the stone is as interesting as it is complicated. Some of it can actually be derived from the stone itself for some of the owners of the magnificent gem inscribed their names and/or additional inscriptions on it. The spinel takes its name after the great Asian conqueror Timur (or Tamerlane). After Tamerlane, the stone was inherited by his son Shah Rukh and by Shah Rukh’s son Ulugh Beg. During the latter’s reign, there were many wars with the Persians and at some point, the ruby fell into the possession of Shah Abbas I of Persia, who in 1612 gave it to his close friend Jahangir, the Mughal Emperor of India. The ruby was inherited by Jahangir’s grandson, Aurangzeb who created one of the greatest Empires in history by expending the Mughal Empire to more than 3.2 million square kilometres and ruling over a population of 100-150 million people. 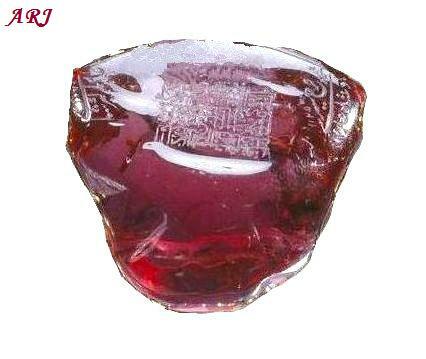 Aurangzeb was succeeded by his son Bahadur Shah I who, despite owning the ruby, never left an inscription over it. Bahadur Shah I was succeeded by his elder son Jahandar Shah, who himself was succeeded by his kinsman and Aurangzeb’s great-grandson, Farrukhsiyar. Of them, only Farrukhsiyar left an inscription on the stone, which read: “This is the ruby from among the 25,000 authentic jewels of the King of Kings, the Sultan Sahib Qiran [Tamerlane], which in the year 1153 [1740 AD] from the jewels of Hindustan reached this place [Isfahan]. After Farrukhsiyar, Rafi-ul Darja – a distant kinsman – became the 10th Mughal Emperor. Rafi-ul Darja was succeeded by his elder brother Rafi ud-Daulah (better known as Shah Jahan II) whose reign lasted less than a year. After he was murdered, the Throne (and the ruby) went to Bahadur Shah I’s grandson, Muhammad Shah – the last owner of the ruby from the House of Timur. In 1738, the increasingly weakening Mughal Empire was conquered by Nader Shah, the Shah of Iran and founder of the Afshand dynasty. After defeating the Mughal army at the epic Battle of Karnal on 13 February 1739, Nader captured Mohammad Shah and entered with him into Delhi. Soon, a rumour spread that Nader had been murdered and Indians killed some Persian troops. In retaliation, Nader Shah (who was very much alive) ordered his soldiers to plunder the city and kill everyone in it. Over the course of just one day, nearly 30,000 Indians were killed. That forced Mohammad Shah, who had been unrelenting until then, to beg for mercy. Nader Shah agreed to withdraw but only if Mohammad Shah handed him the keys to the Royal Treasury. Nader thoroughly looted the treasury and the Mughal Empire lost not only some of its greatest gems – the Timur Ruby, Koh-i-Noor, Darya-ye-Noor – but also the Peacock Throne, which thereafter served as a symbol of the might of the Persian Empire. The plunder seized from India was so great that Nader Shah actually stopped taxation in his country for three years. After Nader Shah’s assassination in 1747, the stone fell into the possession of Ahmad Shah Durrani, the founder of the Durrani Empire who is also regarded as the founder of the modern state of Afghanistan. Ahmad Shah was the very last person to leave his inscription on the stone, which he did by erasing the previous inscription by Timur himself. The Timur Ruby didn’t remain in Persia for long, however; Ahmad’s Shah’s grandson, Sah Shujah Durrani, was expelled from his homeland and forced to seek refuge in Punjab, where Maharaja Ranjit Singh, founder of the Sikh Empire, forced him forced him to surrender the jewel. When the Punjab was annexed by the British East India Company in 1849, all the State jewels came under the jurisdiction of a Board of Administration. In April 1853 Garrards set four of these rubies in a new diamond-encrusted gold and enamel necklace of Oriental design, with four diamond pendants also from Lahore. The centrepiece of the necklace was the Timur Ruby in all its glory. 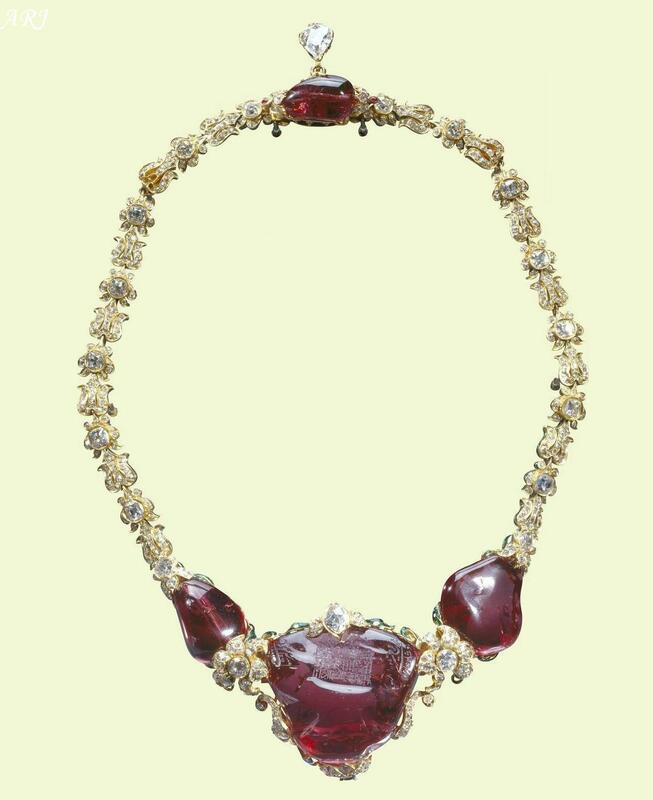 Two months later, Garrards adjusted the necklace to allow this stone to be detached for use as a brooch and to alternate with the recently re-cut Koh-i-Noor diamond. In 1858 three of the five pendant diamonds originally attached to the centre of the necklace were made detachable for alternative use, two as earrings and the central pendant (the Lahore Diamond) as the centre of the Coronation Necklace. Despite all these changes, and a further change made on Queen Mary’s orders some time later, the necklace has never actually been worn. 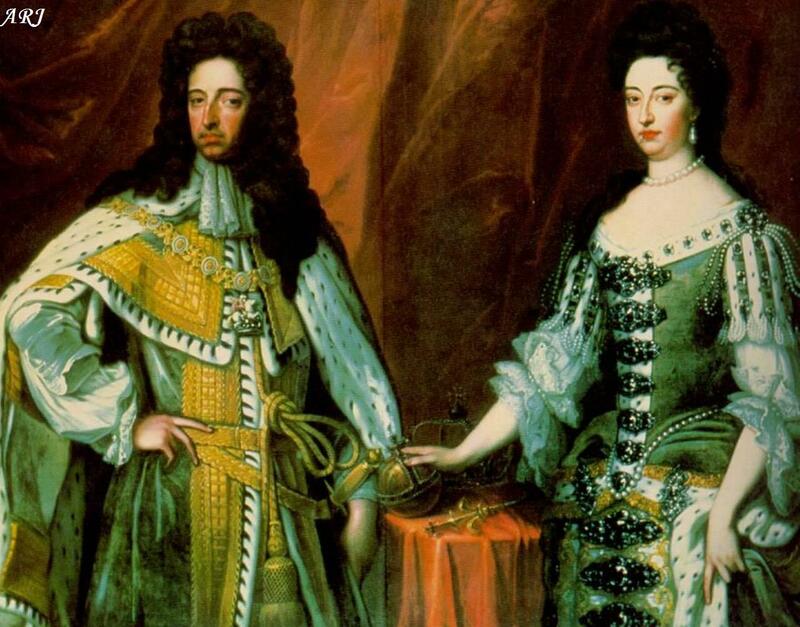 Queen Elizabeth is said to be fascinated by the necklace; in fact, she once said that the necklace is so lovely she should have a dress specially designed to wear with it. Unfortunately, like her predecessors, she has never done so. I can see why: not only is it incredibly significant from historical point of view, it may also be viewed as a politically incorrect step to wear a stone with such a rich Indian heritage. To learn more about Royal Jewels, historical and current, have a look at the Royal Jewels Blog.